The Allied commanders of World War II saw the need for airborne troops in Europe during the German invasion of Crete in May 1941. Although German paratroopers nearly met with disaster, they eventually succeeded in taking the island. The German attack was the first time an invasion of an island was successfully accomplished by air, and though the near failure made the German high command wary of relying much on paratroopers, the Allies saw the advantages and began training their own airborne forces. Paratroopers were valuable because they allowed the Allies to drop light infantry behind enemy lines, enabling them to deploy a fighting force without warning. Two of the most active of the American airborne divisions were the 82nd and 101st, though there were others, including the 17th, 11th, and 13th. American airborne troops fought in battles in places such as North Africa, Normandy, the Netherlands, Sicily, the Philippines, and elsewhere. Paratrooper’s equipment being inspected before leaving on invasion of Europe. British paratroopers landing on the Greek mainland from American planes of the 51st Wing, USAAF. Paratroopers entering a plane, North Africa. American paratroopers on their way to Sicily. Paratroopers fixing their static lines before jumping to their objective. A paratrooper making a jump during the invasion of southern France at H-4, D-Day, 15 August 1944. Paratroopers leaving Douglas C-47s, in preparation for further landings somewhere in the Philippines. Luzon, Philippine Islands, June 1945. Members of the 11th Airborne Division dropping out of planes to start the attack on Appari Airstrip in Northern Luzon, Philippine Islands. Do you have any family members who were paratroopers? Tell us about them! Or find more images and documents about the paratroopers of World War II by searching Fold3. My uncle PFC Elliott Russell Lund was a paratrooper with the 17th Airborne Division and saw action in the Battle of the Bulge as part of George Patton’s push to break the German’s siege on Bastogne and free the 101st Airborne. Unfortunately he was captured by an elite SS unit, marched to StalagIVB where he later died one month before the end of the war in Europe. In December 2008 I published a book about him and his unit, the 513th Parachute Infantry Regiment and the following year he was awarded the Purple Heart posthumously. I thank him for his sacrifice and service so that we may live in freedom of the USA!!!! And hats off to the many of the Veterans who served in this and all wars. As a Veteran myself of Vietnam I can appreciate the value of all who serve our great country. First I want to thank you for your service to our country as well. Like you I salute all of our Veterans who have fought to keep us free. My family tree is filled with Veterans dating back to the Civil War and possibly the Revolutionary War. I am also a US Army Veteran and my father served in the Pacific in WW2 on an LCT and was training to assault mainland Japan when the Atomic bombs were dropped on Hiroshima and Nagasaki. Thanks again for your service and for your comments on my recent post. My younger son just told me he ordered your book. l left 2 messages for Marcia Thorpe in these comments about the role of African Americans in the paratrooper ranks in WW II that I discovered because of this comment stream. I’m grateful you started it. I didn’t mention that my Dad’s passing in 1987 was ruled service connected. The doctors at the VA who had been treating him for years said his war injuries and the nerve damage it caused had weakened his heart. Though he had been classified as 100% disabled after the war I’m glad he was able to lead a fairly normal life till his sudden death at the age of 65. I have framed his certificate from basic training and promotion to Corporal, from OCS, pictures from the war and Army, and his Purple Heart. There is not a day that has gone by since the day of his death that I don’t think of him. Thanks again. My Uncle was in the 101. Never talked about the war. Thank you for your Father’s service. My Dad, Howard E. Bowers was in the 11th Airborne Division of the 675th, as a Staff Sargent. He died in 1959 7 months before I was born. I would love to find out more about what he did and went through in Luzon and the Philippines. If you could direct me to the right direction I would greatly appreciate it. May God bless your late uncle PFC Elliot Russell Lund of the 173rd Airborne Div. I would be most interested to read the book you wrote about him and his war . I will say a prayer in church tomorrow in his memory. I am also a paratrooper and was blessed to have had several WW II veterans as officers and NCO cadre in our little LRRP unit in the 1960’s We all remember these men with great respect, admiration and love for who they were and what they did to save this world from a diabolical future. Your uncle is no exception . I’m a Belgium active soldier and a WW2 airborne friend … Could you tell me more about your uncle … I live in Liege 30 min from the Bulge area . My father was in the 17th, 193 GIR and made 3 glider invasions, including Varsity. Does your book cover any info on the 193, 194 GIR? If so how can I get a copy of your book. The book Thunder From Heaven shows your relative, Elliot Lund as a member of the 513, MIS (not sure what MIS means); however if he was in the 913, he may have participated in the “Dead Men’s Ridge” encounters which is mentioned in the book. Thanks for the info. I will try to obtain a copy of the book “Thunder from Heaven”. Yes my uncle Elliott R Lund was in the 513th PIR of the 17th Airborne Division and saw action in the battle of the Bulge on the western outskirts of Bastogne. MIS as you mentioned is probably the designation for MIA actually. I did a lot of research and wrote a book “Missing in Belgium” about my uncle and his unit, from Boot Camp and Jump training all the way to his capture and captivity in Stalag IVB. He was posthumously awarded the Purple Heart in 2009. Your father was Clarence E Monkress ??? Yes he was Clarence E. Monkress; do you have any ifo about his service etc. Pfc Clarence E Monkress ASN: 37520900 . 193GIR HQ, 194GIR and 326GIR Co D.
Could you tell me if he passed away on Nov 11, 2004 and buried in Cleveland ? Yes dad passed away on Veterans Day 2004, and is buried in Cleveland, Ok. Thank you for your info and help. Is there anymore info out there about his units and the battles they were involved in? He didn’t talk much about it. Now that I look back on his life I think he was suffering from PTSD all those years with no help. Hope you will find some good info about your dad . My thanks for telling your Uncle Elliot’s story and his memory will always live in the service he gave to his country. Your Uncle Elliot was part of those whose saved my father, First Lt. Sidney Israel Karesky who was with the 517th Regimental parachute Combat Team attached to armored units. My father had joined the army in 1940 at the age of 19. He saw combat in North Africa, was shipped back to the States, went to OCS and then Georgia where the 517th with other units trained and was shipped to Italy as part of the 101st Airborne. He saw 180 days of combat in all according to his records. Dad’s unit was right at the point where the German attack began in the Battle of the Bulge. And indeed they were saved by General Patton’s tank and men like your Uncle Elliot. My father was severely wounded and after Patton’s armored units and men under his command made it able to ship him and the other wounded out, he spend six months in military hospitals. Dad passed away on January 17th, 1987 but I will always remember the things he told me about the war and how grateful he and his fellow paratroopers were to see Patton’s tanks and accompanying paratroop units arrive. I believe it is our job, to make sure that the memories and sacrifices of the men like your father and my uncle who bravely fought World War 2 live forever. I am curious how close your father and my uncle were during the battle for Bastogne. I will look through the material I have while writing my book on your fathers unit 517th and let you know what I find. Was hw a member of Band of Bros. who +rained in +occoa, Georgia a+ CURRAHEE M+n.? I know my Dad trained in Georgia at Fort Benning. His company. which was a part of the 517th Regimental Paratroop Combat Team attached to armored, was stationed right where the Germans began their counterattack in the Battle of the Bulge. When Patton’s tanks and troops arrived, there were only 16 of the company left alive. Years later in 1968 when I was a student at the University of Arizona, I met a student who in conversation about the war, said his father who was a paratrooper and fought in the Battle of the Bulge, said his father told him the same thing, that there were “only 16 of his company left. Sadly, we didn’t get each other’s names and contact information a the conversation occurred at a U of A football game and I never saw him again. There is a good sized documentation on Wikipedia about the 517th. Russ – My Uncle, Ralph Ray Kearns, was in the 513th PIR during the Battle of the Bulge and Operation Varsity. Is your book still available? Do you have info on individual soldiers (like my Uncle)? Thanks. I have a lot of researched info that was used to write my book including many individuals. I will check my material and see if I have anything on your uncle. I did mention Operation Varsity in chapter 7 to pay tribute to the entire Division. 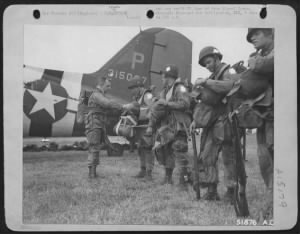 The 17th Airborne Division played a major role in ending the war and Operation Varsity, which the 17th participated, was and still is the single largest Airborne drop in a single day in history. Do you know what company he was assigned ? My uncle was assigned to “B company- 1st Battalion- 513th. Their unit had run out of ammunition during their battle with the 3rd Panzer Grenadier Division and Remers Fuhrers Begleit Brigade, an elite unit. My book is still available on Barnes & Nobles.com and Amazon.com. Your uncle was D Company … I don’t have more info but I don’t know if you are in touch with the 17th Airborne association which could help you . Thank you. My uncle was indeed in Company D of the 513 PIR, 2nd Battalion. He lived for 88 years, passing away a little over 3 years ago. Towards the end, frostbite injuries from the Bulge took away the feeling in his feet and his ability to walk. He visited me when I was stationed in Germany, and I was able to take him to Bastogne, the Mardasson, and the museum. Listening to him tell stories of the war was fascinating. Shortly after he passed away, I was able to visit the fields of Operation Varsity. Sure wish I could have shown him the pictures. Through a 17th Airborne site on Facebook, I found pictures of the Company and was able to identify him. He remains a family hero. Do you have more info you could tell to me about him ? His father was an Army Lt Colonel during the War, while his brother (my father) was in the US Navy (Pacific Theater). He fought in the Battle of the Bulge (where he told me the thing he remembered most was the cold) and jumped into Germany as part of Operation Varsity. He was under fire as he descended during the jump. He received a Bronze Start (V) and I believe two Purple Hearts (shot once, blown up a couple times). After the war, he became a chiropractor and afterwards lived the rest of his life in Beaufort. He was an active member of 17th Airborne veterans groups and attended their reunions in the US. He only visited Europe once after the war, and that was to visit me when I was stationed at Ramstein (as I described earlier). I know of very few people as highly respected as my Uncle was. His obituary is here: http://www.andersonfuneralhomebeaufortsc.com/memsol.cgi?user_id=1205128. The 17th Airborne talon is engraved on his headstone. Thanks Donn, can I ask you more if it’s not to private of course ??? Just need to know where he is buried ? saw on his obit St Helena but which state ? also do you know his rand at the end of the WW2 and if you have his Army Serial Number ? And many vet I drove here have the same memory about the Bulge … How cold it was …. You must be collecting a data base of information on the soldiers of the 17th Airborne. I forgot to mention that my uncle was MIA, his parents (my grandparents) notified, and then he was found in a hospital in France. To answer your questions, hIs serial number was 34917003, and his rank was Sergeant (SGT). He is buried in St. Helena’s Cemetery in Beaufort, South Carolina. I will be in Germany early to mid February a little west of where Operations Varsity occurred. My son-in-law and I are going to tour the Ypres battlefied while I’m over there. Thanks for your uncle’s info Donn ..
my father James William Jones served in 101st, 502 company A. I have no records of his service. I do have several pictures of him and others. Do have any information on him? Serial number is 34809173. I have his discharge. Departed US 23 Jan 45. Departed Europe 29 Dec 45. Do you have any information on Willie (William) O. Steadman? He was in 101st, 502 PIR, 3rd Battalion, Company I. I know he jumped into Normandy D-Day, Operation Market Garden and was in Battle of Bulge where he was wounded and sent back to London in January 1945. I have written for military records but was informed records were burned in a fire at military storage building. Any help would be greatly appreciated. T/4 William O Steadman ASN: 14079974. 101st Airborne, 502PIR Co I. 2 combat Jumps; D-Day and Holland. Thank you so much. You have some wonderful information. Thanks for what you are doing. An honor for me to help US family. These guys, and all our vets, are amazing. I hope you can see my response to Donn Kearns where I discuss the 17th and their role in Operation Varsity, and where you can find my book. If you can’t see my response or you have any other questions please let me know. My Uncle, Kenneth Hope, was a paratrooper with the British First Airborne Division, 80th Reconnaissance Regiment (“Pegasus” unit) who were transported by Horsa glider from Tarrant Rushton Airfield in Dorset into Oosterbeek Holland on Sept. 17, 1944 as part of the assault group to take the bridge at Arnhem.He spent the next ten days in house to house combat as the Airborne trooper were squeezed by the 9th and 10th Panzer Division. Sixty-five hundred paratroopers were dropped into the operation but only Two Thousand were able to escape at night across the lower Rhine unwounded. My uncle was among those lucky few and later able to relate his stories to many authors, including Cornelius Ryan (A Bridge Too Far). He saw my brothers playing with some cheap toy walkie talkies once and said with tears in his eyes “If we had only had radios as good as these at Arnhem.” You had to have guts to land in a war zone with limited firepower. Is there any information on the black troops stateside who tested the parachutes? Years ago, my sister worked with a black gentleman who was among those who did testing before the ‘chutes went into general use. Google: Black troops testing parachutes in WW II. You will find pictures and some information. When I was teaching High School Social Studies I always made sure my students knew the contributions minorities and women made to our war effort both in the States and overseas. That is one bit of information I didn’t come across. I’m almost 70 but never stopped learning. I did while in college at the University of Arizona meet the son of the great General ‘Chappie’ James, one of the most famous of the Tuskegee pilots. Daniel went on to become a Lt. General himself. My family is of Russian Jewish background. My Dad always said “one thing war teaches you very quickly is we all bleed the same blood. Thanks for giving me some new knowledge which I plan on reading more about. Ed Karesky again. Google “Jumping Into History: The Army’s First African American Paratroopers.” Thank you again. Google: “Jumping Into History: The Army’s First African American Paratroopers.” Great historical article. I’ll look up his site. Thanks again! My Father Howard Edward Bowers was in the 11th Airborne Division of the 675th, that was part of the liberation! I would love to find out more. I see you have many photo’s. Howard Edward Bowers, my father, son of Joseph Edward Bowers and Bertha Mae Worthington was born in Whitchata, TX. Nov.1st, 1922. When he was seven he was in Mass. with his parents. His father was a Hydrolic Engineer, and built Damm’s all over the country. He went to High School at Fort Peck, Valley Co., Montana and was very active in sports. By 1942 he is in Portland, OR with his parents. Howard enlisted in WWII in 1943. Here is his Military Records. 25 Feb 1943 Portland, Multnomah CO, OR. He was a Fire Control Instrument Operator 645, Parachutists Badge. Served in WWII and fought in battles at New Guinea, Southern Philippines and Luzon. He received- Philippine Liberation Medal with two Bronze service Stars, Asiatic Pacific Service Medal, Distinguished Unit Badge Go 68 HQ WD 45, American Theatre Service Medal, Good Conduct Medal and a Bronze Arrowhead Victory Medal. Army of the United States Honorable Discharge. This is to certify that Howard E. Bowers 39-327-103 Staff Sargent 675th PG FA BN 11th AB Division, Army of the United States. Is hereby Honarably Discharged from the military service of the United States of America. This certificate is awarded as a testimonial of Honest and Faithful Service to this country. Seoeration Center- Given at Fort Lewis, Washington. Certificate is in possesion of Heather W. Bowers. After the war, Howard married Helen Emilie Cowan on 7 Sept. 1946 in Woodburn, Marion Co., OR. Howard went to College and received a Masters degree in Geology. Death was on May 13th 1959. His name was listed as Howard Edward Bowers. Birth was 11-2-22, he was 36 years of age at time of his death. Occupation was a Geologist, and worked for the US Government. Born in Wichita Falls, Texas. Father was Joseph Bowers, mother was Bertha Mae Worthington. He served in WWII. His SS. # is 517-12-1063. Informant was the VA Hospital Records. Cause of Death: Spontaneous subarachnoid and right intraventricular hemorrhage. Hemangioma of intrinsic arteries of right caudate nucleus. Autopsy was performed. Other significant conditions contributing but not related to the termanal disease……. The VA attended the deceased from May 1, 1959 – May 13, 1959. Death recorded at 7:30 AM. Signed: Warren V. Huber, MD., V.A. Hospital, Denver, Colo. 5/13/59. Buriel, 5/18/1959, Fort Logan National Cemetery, Arapahoe County, Colo. Funeral Director: Gene Carey at Capitol Mortuaries, Denver, Colo. Rec. 5/18/59. Registar’s Signature. Fredy L. O’Bryan-Dp. Howard E. Bowers; 1922- 1959. Services were held at Chapel of the Angels May 18, 1959. Officiatting Rev. Francis J. Syrianey, Our Lady Of Fatima Catholic Church. Interment Ft. Logan National Cemetery Denver, Colorado. My uncle, Charles Webster, was in the 101st Airborne and he landed in Normandy on D-Day. He was wounded, shot in the shoulder, at Eindhoven Holland and received the Purple Heart. His wound was treated by a captured German doctor. For the rest of his life he could never lift his arm above his head. One time, right before they jumped, it was noticed that the Germans had driven many, many stakes into the ground several feet apart in the area where they were going to land. So, everybody jumped in different random places. Charles landed in a tree. He managed to get down but was lost, all alone behind enemy lines in Holland. He hid in a barn. All he could find to eat were some donuts and apple cider. After he was rescued a reporter for some newspaper interviewed him and published his story. Charles always laughed and said that at least he was lost in Holland where the local people were friendly and on our side. His brother, John Webster, was a Ranger and during the Battle of Anzio he was lost behind enemy lines in Italy where the local people were against us. Luckily, both brothers survived the war. Charles was born in Middle River, Minnesota on Dec 21,1920 and died in Neptune Beach, Florida on May 19, 2011. Sgt Charles L Webster . 101st Airborne, 502PIR, Co G .
My uncle, Byron G. Sherman, was with the 82nd Airborne during this operation. During his paratrooper training he wrote a series of articles for our local newspaper describing the training experience. After the war, he went back to school and became an anesthesiologist, eventually heading the Anesthesiology Dept. He died in 2013 at the age of 93.
know you could stay alive eating grasshoppers until he cooked one in a spoon. My father in law, Captian Paul H Brock, Jr, Service #0367148 was a member of the 320th Glider Field Artillery Battalion of the 82nd Airborne Division. He was awarded the Bronze Star and Purple Heart during the June 6, 1944 D Day invasion. I have little other information about his service as apparently a lot of Army records were destroyed in a fire in St Louis in 1952 and a lot of the 82nds records were destroyed in a fire at Ft Bragg in 1946. If anyone has any idea how I might get some information on him and/or the units he served with, I sure would appreciate it. He served from March 20, 1942 to December 18, 1945. He was born in Pensacola, Fl on March 4, 1917, lived in Tallahassee, Fl until his death on June 4,1967. Your father flew mission Elmira Chalk 9 C 47 42-15108 Glider “MAJA” 3G4949. Can anyone tell me where to look up a great uncle to see where he served and what campaigns he was involved with? You could contact the 505RCT family and friends … they could help you like your father was a 505PIR Co F.
Please give me your great uncle’s name. Domi, I’m trying to find out , i only have 2 people that might have his name. The only reason I am assuming Africa campaign is bc the letter was said. To have stated…..”can’t tell you where I am right now but I can tell you we HAVE ROMMEL on the run” thanks for trying to help DOMI, if I get a response I will certainly let you know. Thanks again for your help in my Intrests for my quest of family facts and knowledge. How do I look up the big red one? Thanks again for all your help. My husbands uncle was in the 101st airborne who invaded Normandy behind enemy lines the night before. He is a true hero. He was awarded the silver star and distinguished service metal. So was my grandpa. I’ll have to find out more info. So interesting! I was in 2d Bn (Abn) 508th Infantry in1964/1965 then sent to RVN. Came back to Ft Bragg for assignments with 82d and Spec Ops over the years. Last assignment with the 82d was as commander of 2-508. Jim Torpey….are your people from Bethlehem, PA? My father was in the 82nd and he was stationed in Europe. My grandfather died in December 1944 so Im not sure about his units movements as he was in the States for the funeral. My father in his short life carried the pain of war for most of his adult life as shrapnel was lodged in his body. Today he would be violently opposed to the nazi headed to the White House. His first heart attack was on Nixons first inauguration. My thanks to your father for his service to the United States. My father would concur with yours. Not a forum to vent political frustrations. With ancestors in the revolutionary war, civil war (Confederate), WW1, WW11 and Vietnam myself, I honor these men mentioned here for their service and sacrifice. I don’t see a “nazi” going into the White House and we need to support whomever is elected contrary to our political views. My uncle spent 315 straight days on the front lines and just after a couple days at rest was put back on the front lines when the Battle of the Bulge began. My Uncle, Pfc Ludie L Smyth, was also with the 513th PIR CO H and participated in Operation Varsity. Sadly he was KIA on April 3, 1945 in Buldern, Germany two days after his 26th birthday while on a patrol to take out a German snipers nest. Unfortunately he was shot by a German sniper and died instantly. Before joining the paratroopers in Fort Benning he was stationed at Fort Mears in the Aleutian islands when the Japanese attacked there in 1942. He was awarded a Silver Star and a Purple Heart. I feel I knew him through the stories my Dad told me and the many letters I have that he wrote to his family during the war. My Dad, Sgt.Tomas Smyth, was also in Germany at the time of his youngest brother’s death with the Army’s Field Artillery. He was also stationed in Pearl Harbor at Schofield Barracks with the Coast Artillery when the Japanese attacked in 1941. Sadly my Dad passed in 2001. He was a very patriotic man and was proud to be a veteran. They also had another brother Nadine Smyth who served with the Navy in the South Pacific during the war. My grandmother had to be a very strong women with all three of her sons serving their country during the war. I thank all veterans for their service and sacrifices. God bless them all. Wow I certainly think your family really lived a “saving private Ryan ” I am here to say thank you to you and your family for there bravery and sacrifice for our country. My father was in the battle of the bulge and won a bronze star. As others, he never talked about the war. He did, however, once offhandedly remark that the bravest men he knew were the paratroopers. He said if they walked into a bar, they never paid for a drink, out of respect. My father, Beverly Pierce (BP) Fuller, was in the 82nd and 101st airborne and parachuted into Belgium in Operation Market Basket and saw other sorties in Anzio, Italy, and the Sicilian and N. African Campaigns. According to him, he was one of the first men to join the paratroopers and trained in Puerto Rico, where he learned Spanish. He went on to learn French, Italian and Dutch while in WWII. He started in the Infantry originally, but I have very little info on his service, as the records burned. I would like to know how to research his years of service. He first went into the Army when he stopped in to visit 2 of his older brothers, who were patrolling the border of W. Texas along the Rio Grande during the ’30’s, and they signed him up, although he was on his way to California to see if he could join the Navy. He was probably underage then, and joined as a stable boy with the Cavalry at Ft. Davis. He told stories of patrolling N. Africa chasing Rommel, his assault efforts in Sicily, Monte Casino in Italy, and lastly, Belgium. He was wounded during this invasion, and died at the hands of negligent staff at the VA hospital in Dallas in 1990 because he got the orderlies in trouble for not attending to a paraplegic who had fallen off his bed but was tangled in his sheets inches from the floor face down, where he stayed for several hours. Daddy sailed a bed pan across the room to get the orderly’s attention when a doctor was walking by and Daddy scolded them in earshot of the doctor, who then reprimanded those men. They took revenge when Daddy had surgery a few weeks later by ripping off his neck brace the day after he had spinal surgery from a wound suffered during paratroop training. He died a few days later from lack of heart meds. As sad as his ending was, I would like to know more about his service during WWII. Any help you can give me would be appreciated. I do know that Mother met him during one of his drill team’s performances in Washington D.C. He caught her eye as he had such lovely red (and gold?) braid on his uniform. His drill team performed with rifles used as batons are in ball games at different Washington, D. C. functions. I am sure this was before WWII, so he had to be out of the service prior to Pearl Harbor, or had re-enlisted just after. He attained Master Sergeant before mustering out as a private after WWII for a difference of opinion with his lieutenant, who was killing Daddy’s new recruits. Did you try to contact the 505RCT family and friends ? they have WW2 vet from the 505PIR and maybe could help you. Thank you! Have you been in contact with Filip Willems? In my roster your father was at the 377PFAB also at the 463PFAB and 505PIR HQ … Maybe I’m wrong …His nickname was “BP” and apparently he made the South of France combat jump with the 463PFAB. Sir, In your roster do you have the name Sidney Israel Karesky/ He was with the 517th Regimental Parachute Combat Team. Saw action in North Africa and was wounded in the Battle of the Bulge. Having trouble getting info as I think his records were destroyed in the fire. any info you can give me I would appreciate. Thank you. Yes I have 1Lt Sidney I Karesky, 51PRCT Co F passed away in 1987. I don’t have his Army Serial Number and If he made the South Of France Combat Jump . Thank you so much for finding him listed. , Yes, he did make that jump. I have a great picture of him sitting in a lounge in Rome, Italy before that. Ed, I have met several 517PRCT vet in South Of France during ceremonies. My best friend jumped also during Dragoon Ops with the 551PIB . war at Hitlers Eagles Nest in Berchesgarten. My Father was a Paratrooper in WWII Germany, He stayed in Germany for almost 10 years in the 1940s. He was in the 101st Screaming Eagles. I remember my Father had scars in his face and legs due to the shrapnel. I have a Sibling out there that might be in his late 60s, born in Germany. He was a product of the war. I did my DNA in hopes of meeting him one day. My Father was Gonzalo Canales , I am proud of my Dad. The only thing, my Dad had me late in age and I didn’t get to spend enough time with him. My Dad was born in 1922. Missing my Dad. Thank you Mrs Fuller , I greatly appreciate the info. You are most welcome. I like to suppose that perhaps our dads knew each other. He was a little gadfly, attached from one troop to another and did hand to hand combat throughout St. Mere Eglise, and other places. When he parachuted in, (the movie The Longest Day was about this event.) he took a bullet through his leg and continued to fight for several days, and remarked that his toes were squishy with the blood in the boot. At one point, he was separated from his platoon, and went on fighting building by building. He finally fell asleep in the hay mow of a large barn on the outskirts of a town. A lovely young girl found him and woke him, and excitedly told him he had to leave, there were German soldiers bivouacked in their home. He asked how many and she indicated about 10. Daddy then asked where the latrine was and was told it was between the house and barn, which are connected, but he didn’t have time for that. He waited in the latrine, or nearby, for each soldier to come down, and he killed them one at a time, dumping their bodies in the next horse stall. He had not eaten for several days and had little sleep, and when he was killing the last one, he passed out. He thought he had died. When he came to, he was in a white room, wearing a white gown and a lovely blond girl was talking to him. He had learned some French and a little German and between the two was able to understand. She would bathe him, bring him food and the chamber pot, and this went on for several days, so each time he woke, he again thought he was in Heaven. (His father was a minister of the fire and brimstone variety). He was finally strong enough to get up and walk around one day, and he gingerly made his way downstairs to the kitchen, where the whole family jumped up to aid him. HIs uniform was mended, starched and pressed, and folded neatly on a chair. He finally found his way back to his troops and was sent to recover back home. He weighed 185 when he jumped and was down to about 130 when he was reconnected to his company. Many years later, in the ’90’s my nephew was in Germany with the Army, and was sent out on the big games day. He and 2 friends were discovered in a hay mow in a barn on the outskirts of a town. (Sorry, I didn’t pay attention to the names.) HE looks like my father’s twin except with a tan, as his father is Hispanic. Anyway, when the grandmother saw my nephew she asked if he was from Texas, to which he replied Yes. She asked if his grandfather was B.P. Fuller, and he said yes. He was feted and hailed as a hero, and when his time was up to return to base, they drove him and his 2 friends 2 blocks outside the base in Wurtzburg and dropped them off. With all the beer and sausages they had consumed, each had gained about 10 lbs, and they strolled in with freshly ironed and starched uniforms. Their CO questioned them, but they said nothing. This grandmother was the beautiful young lady who had nursed my Dad during his stay in their attic, which was whitewashed, giving my Dad the idea he was in heaven. I wish I could find out more information, but when he died, none of us kept the paperwork he had accumulated. We were just too angry at what this black orderly had done to kill him at the Dallas V.A. My uncle, Gordon Champion, was a paratrooper with the 517th PIR. He trained at Toccoa, GA and I remember him saying he was in the 2nd “E”asy Company. That statement only came after the Band of Brothers series came out on TV. He was in Germany through 1946. The grasshopper clickers were used when the U.S. forces were behind the enemy lines as a means of identification. Perhaps someone else can say more about this. My husband is an avid reader and remembers reading about this. He does not know anything about solders eating grasshoppers as a food source but says it probably did happen. My first cousin died at Normandy. Wanted to add a few remarks about my cousin Robert Omega Benton. He was not killed on D-Day but on June 18, 1944.The following copied from World War II Young American Patriots, 1941-1945 “Pfc. U.S. Army, Age 26. Entered service Apr. 4, 1943, Camp Wolters,Tex; Ft. Benning, Ga; La. Maneuvers; Nebr. ; England. Killed in action in France, June 18, 1944. Awarded PH, 3 BS, CIB, G. Cond. M. Attended Goldsboro H.S. Free Will Baptist Church. Son of Mrs. and the late Mr. S.B. Benton, Goldsboro, NC. Husband of Mrs. Sallie Walker Benton, Rt. 2, La Grange, N.C.: Got the info from Ancestry.com. My dad Philip Shofner was with the 101st Screaming Eagles and also the 52nd. He landed on D-Day near St Mare Igles and was shot in the arm and that was the end of the war for him. When he was being evacuated, a friend said come with him but the boat was full. He later saw his friend’s ship being sunk. What almost killed him was the medication. I think it was pencillan and being a new drug they were guessing at dosages. Left him in the hospital for many months. He met my mother in England. When he finally went home to Shelbyville TN, he did war bond drives. He was 502PIR Co C.
My father was with the Screaming Eagles also, his name was Edward M. Blasko. He told me he was the cook in the outfit, and that many times just after he left the tent it was blown up. That is all he told me about the war but like I said in my other quote I have a book they but together that did show some pictures that many of men did not want to see again. Do you have lists of men with their unit during the time they served overseas? I just have one Edward M Blasko … if it’s correct he was at the 101st Airborne, 801st Ordnance Company. I forgot one thing, he was with the Screaming Eagles, that I know for sure. I have a book that he had that has that name on it. Sharon, if you have some pictures with him wearing his uniform … or maybe his discharge ??? His discharge papers are falling apart, it is so fragile. I have other pictures besides him in his uniform, I have pictures of him next to a glider, with his men and lots more. Where are you located? Do you have a private email address where I could maybe write you or send the pictures too? I know his basic training was down south somewhere, my mother went down to watch them jump. They lost men before the even went over seas, their parachutes did not open. My mother thought my Dad was one of the men, but my Dad was in the hospital because he thought he was having a appendix attack. He was lucky that day, and my Mom was so relief to hear where he was. Has anyone heard that story? Gloria – my dad said the first thing you did was get rid of the clickers since the Germans figured it out and used them to lure Allies. My uncle Andrew Kasprzyk, was an airborne paratrooper, from what I’ve been able to find out with the 17th. He took an artillery shell between the thighs, to the bone, each leg, while jumping Into ?. Afterward, while under treatment, the field hospital tent he was in, caught fire. He was able to save himself by rolling out on the floor and out of the tent. The story was passed to me as a kid. I worked with him for 10 years at U.S Steel until 1980. I was in my 20s then and worked with many a WWII vet. Your uncle was a 194GIR, 17th Airborne. I HAD A FRIEND WHO’S DAD WAS GEORGE B.
I have a big roster about the US Airborne, during the WW2 . I can’t say where I found this info but George B Newport 506/A made the D-Day combat Jump. Everette Richard Shaw was born in Camden, South Carolina on January 16, 1919. He was the son of John Daniel Shaw, Jr. and Carrie Eugenia Bradley. His mother’ s family Bible lists his name as Everett Richard Shaw and that he died on February 5, 1945. However, his military records and his tombstone refer to him as Everette R. Shaw. There is a difference of one day as to which day he died. The records of the 511th Parachute Infantry Regiment Troopers Killed in Action During World War II state that Shaw, Everette R., D company, died February 4, 1945 at Imus on Luzon Island in the Phillipines. He was a Private. The difference in the date can be explained by the fact that there is a difference in time zones and someone may have recorded the day in the United States when the message was received. The date is only important when researching what was happening with his unit at the time he was killed in action. His niece, Bobbie Sims, remembers the story at the time of his death that he was shot during a parachute jump. It appears from the reports that he landed safely and continued his mission for about 20 miles until he was killed at Imus. We have not reviewed his official military files so we do not know what is recorded there. (The military records were destroyed in a fire at the government storage center.) One member of G company, 511 PIR wrote of his experiences on the February 3, 1945 parachute jump. It is on the internet at http://groups.msn.com/G511thAirborne/markstank2.msnw. The jump was at Tagaytay Ridge on Luzon island. He wrote that It was easy getting out of the chute. No shooting. He did say that there were a half dozen jump injuries. Then he described how they traveled about twenty miles on trucks and jeeps …before the scouts ran into Japanese resistance just south of Imus. Imus is a small town just about four to five miles east of the big U. S. prewar Naval Base at Cavite. We then got off the trucks and started on by foot. As we moved on, hundreds of Filipinos surrounded us with cheers and tears screaming Mabubay. They gave us water, bananas, papayas and mangoes. The sheer joy on their faces is still hard to forget. At one crossroad, there was a four-piece Filipino band struggling with the Star Spangled Banner. We spread out. E-511th PIR was on our left and D-511th PIR on our right, which put HQ2-511th PIR right smack dab in the middle of the entire 511th PIR advance. We moved down the road, out of the highlands into flat terrain with lots of trees and some buildings. Imus itself is about three hundreds yards off Highway 17. A narrow black top road ran through the town square, then back to the highway. About halfway down this road lay a couple dead troopers from E-511th. This was probably troopers from D company and not E company. On February 4, 1945, D company lost the following troopers at Imus: Shaw, Everette R. Tahsler, Clifford G. Walter, Anthony G. Gumm, Henry F. Rathert, Edward. On the same date and place, E company lost: Wilson, Edgar L. The major battle at Imus was a stone church which the Japanese had taken up positions in and could not be forced out. One trooper from E company climbed up to the top of the building, cut a hole, poured 5 gallons of gas into the building and dropped in a grenade. Twenty to thirthy Japanese soldiers were machine gunned when they ran out. Some escaped in a truck but were machined gunned by D company which had set up a light machine gun to block any escape. March 17, 1945 North Carolina (name of newspaper (,,,LE I…) Obituary article. EVERETTE RICHARD SHAW – KILLED IN ACTION Everette Richard Shaw, paratrooper, was killed February 5th 1945 on Luzon. The message from the War Department was received the 25th of February but due to the serious illness of his wife, the information was given no publicity at the time. Everette Shaw, private, was the son of Mrs. Carrie Shaw and the late John D. Shaw of Camden, S. C., and was 26 years old. He entered service in June 1940 and served in Panama and South America, returning to the States in 1943. He was sent to Camp Chaffee, Arkansas, and from there to Maryland, then to Fort Monroe, La., for coast artillery training. There he was transferred to paratroopers and went to Fort Benning, Ga. for his jump training. He received the wings of the paratrooper at Fort Benning in late September 1944 and from the 1st through the 13th of October he was on leave, reported to Fort Monroe for two weeks advance work before going to Fort Ord, California, in November. He went overseas in November and for the month of December was in New Guinea, going from New Guinea to the Phillippines where he was in combat missions. The last letter his wife received from him, dated January 21, was written from a rest camp where he was spending a short time following combat. He spoke of the successful combat mission just completed and mentioned the hardships of conditions during action, saying that the inch by inch progress over the mountians made one realize what war really is. A letter confirming the death message of the War Department that Private Shaw was killed February 5th on Luzon has been received by Mrs. Shaw. Mrs. Shaw is the former Mary Elizabeth Blackwelder, daughter of Mr. and Mrs. W. P. Blackwelder. She was living in Baltimore when she was married to Private Shaw. With her parents and small brother, she returned to Statesville to live the last of January, 1945, became seriously ill and was and was a patient in the hospital when news of her husband’s death was received. She was not given the message until last week. Surviving Private Shaw with his wife is an infant daughter, Carolyn Elizabeth Shaw, now in an incubator at the H. F. Long Hospital. Also surviving are Private Shaw’s mother, who is here at the present on a visit to her daughter-in-law, Mrs. Everette Shaw; three sisters and two brothers. The sisters are: Mrs. Kate Brewer of Rock Hill, S. C.; Mrs. Grace Brewer of Camden, S. C.; and Mrs. John Crolley of Charleston, S. C. The two brothers, both in service, are John D. Shaw, Seaman 2-c, now in the naval hospital in Charleston after sea duty in the Pacific and Pfc. Elgie Shaw, Air Corps, stationed in Geneva, Nebraska. There are four brothers-in-law in service also: Archie A. Brewer, Seaman 2-c and Charlie H. Brewer, Seaman 1-c, husbands of his sisters, are both in the Atlantic area serving in the U,S,N.R., and Wade Blackwelder, Seaman 1-c and W. Frank Blackwelder, Petty Officer 2-c, ship-fitter, are both on duty in the Pacific area. Private Shaw’s family is identified with the Baptist church of Camden, S. C.; his wife is a member of the Methodist church. My Grandfather Francis Marion Huntsinger. Jumped and is buried in Rome. I’d like to learn more about him and possibly find any photos of him. I’ve never seen a picture. I believe him to be in the 82nd. Pfc Francis M Huntsinger. 82nd Airborne, 376PFAB. According to the book “Circle and the fields of ‘Little America'”, which is a history of the 376th Parachute Artillery Batallion, 82nd Airborne, your Grandfather Private Francis M Huntsinger of Battery C was reported missing in action during operation “Horrified” (p.180). He was later reported among those who gave their lives in Sicily (p. 176). My father also served in the 376th, Headquarters Battery. Your grandfather’s name is inscribed on the Wall of Missing in the Sicily-Rome Cemetery. veterans. We need to remember these young men who ran to the fight to keep all of us safe. My dad was Army Air Corp B-17. My father PFC Joseph R. Sukovich was a paratrooper in WWII. He was in the 508th PIR attached to the 82nd Airborne from 1943-1945. During his time in Europe he fought in Central Europe, Rhineland, Ardennes (The Battle of the Bulge) and Normandy (The Battle of Normandy D-Day). He was wounded in Belgium and was honorably discharged on March 13th, 1945. He received many medals including the Purple Heart. Thank you for your service and so glad you contributed to the discourse. Potier Dominique, you seem to have a lot information, maybe you can help me. My father served in WWII as a paratrooper. His name was Melvin Lorin Schreiner born in Kansas in 1925. His services records like many were destroyed by fire. He had several patches because like he said his units kept getting destroyed so he was reassigned. He never spoke of specifics when I was younger & then as he got older his memory failed he could not recall. I know he “jumped” the Rhine & was in the Battle of the Bulge. That is where he took shrapnel & had his feet froze. In the hospital in France (I think) they wanted to amputate both his legs. He refused stating he was gonna walk out of the hospital or not leave alive. He recovered & returned to duty. He was then apart of patrols after the war ended. He spoke about rounding up hiding soldiers from all different countries who were starving, scared & didn’t know who to trust. That is about all I was able to gather from his time in Europe. Did you try to contact the cemetery itself ??? sometimes they have some info about the heroes buried in the cemetery . Yes a generation of men that didn’t seek attention for the sacrifices they made as young men. I must always thank the families of veterans for there service, after all they sacrificed there freedom for our country’s freedom. It’s very admirable. My father, Pvt. Raymond E. Vazquez (aka Ramon Vazquez) was a paratrooper in the 82nd Airborne, 3rd Battalion, 508 Regiment “D” Company. I know he was part if the Normandy Invasion and landed in “Sainte Mere Eglise”. He also fought in the Battle of the Bulge” He was injured and received a medical discharge (not sure of the date). I know he was awarded a couple of medals which have been lost. His military records were destroyed in the fire of the National Archives. He passed away in March 2008. He was born in San Diego, CA in February 1925. My father was Oliver T Burgess who joined the Army right after Pearl Harbor was attacked and started out at Ft Hayes. He was shipped to Camp Roberts where they began training in Communications. The Army asked for volunteers for Paratroopers and he’jumped’ at the chance for a transfer. Training took place at Ft. Benning and in the Georgia Mountains near Toccoa. He was shipped to Glasgow, Scotland in January 1944 on the George Goethals arriving February. With additional training he jumped into Normandy on D-Day with additional action in Veghel Holland in September 1944 and Bastone, Belgium in December. He was a Staff Sargent in Supply for 501st Parachute Infantry attached to the 101st Airborne Division for all combat. His actions to supply the troops with ammo during the Battle of the Bulge led to a Silver Star and Purple Heart. He returned to the States on the USS Wakefield in September 1945. While he did not talk a lot about the action, he had pictures from training and a large book that showed Armed Forces activities for D-Day until the end of the war. He attend a few reunions with Army Buddies one of which was at Ft Lee, VA where we were allowed to jump from a 24 ft tower. Do you have any information on unit or pictures of my Daddy, Willie O. Steadman, from Mobile, Alabama? He served in the 101st Airborne Division, 502 Parachute Infantry Regiment, 3rd Battalion, Company I. He jumped June 6, 1944 D-Day into Normandy, Sept. 17, 1944 into Holland, Operation Market Garden and fought in Battle of the Bulge at Bastogne where he was wounded. I did write off for all his military records but they were destroyed in a fire at the military storage building. He passed away January 13, 1995. I first want to thank all our Veterans for their service to our country. I am one that still gets tears in their eyes when I see our American flag flying high or hear the Star Spangled Banner. My Daddy, Willie O. Steadman was in the 101st Airborne, 502 Parachute Infantry Regiment, 3rd Battalion, Company I. He was a radio man and jumped on June 6, 1944, D Day, into Normandy. The regiment had a scattering drop. Daddy landed in a swamp in waist deep water and had to find his unit. So many others were not so lucky. Was wounded in Carentan with shrapnel in his back but patched up and sent back to fight. Was also in the drop on September 17, 1944, Operation Market Garden, in Holland. He was also in the Battle of the Bulge and wounded again with shrapnel in his eye which sent him back to England and then on to the States to a hospital in El Paso, Texas where he recouped and later discharged August 6, 1945. I’m very proud of my Daddy and his stand for freedom!!! My uncle Sam Kramer served General Patton as a direct Sgt. Staff Specialist. He received the French Legion of Honor Chevalier for liberation of French Villages after Para-trooping in during Normandy. The award, given him at the French Embassy on the occasion of his 92nd Birthday by the French Ambassador, livened up the last five years of his life. He’d earned many awards in his service in Europe, but none so sweet as this. He accepted it on behalf of himself and “the men of my company” all of whom he remained close to (or their surviving families) after the war, and who one by one passed before him. What a nice story about your Uncle. Thank you for sharing. I do some volunteer work with old veterans in their 80s and 90s in my area and have learned much from then. Thanks for posting. That’s amazing factual story to hand down to future generations. Thank you for your families service for my family’s freedom. I thank him and all veterans for their sacrifice and service. They were and are the greatest generation! It’s sad that so many young people today have no idea how important all of our veterans are. wounded, he was eventually evacuated and in April 1945 was medically discharged. His awards included two Purple Hearts, three Bronze Stars, Combat Infantry Badge, Parachutist Badge, two Presidential Unit Citations, French Croix de Guarre, Belgium Fourragere, and Netherlands Orange Lanyard, among others. In recent years, he was awarded the Certificate of Recognition of D-Day Veterans in appreciation of the Liberation of France by the French Government. Also by order of the Secretary of the Army he became a Distinguished member of the reactivated 101st, 502nd at ceremonies conducted at Fort Campbell, Ky. He died in January, 2005. WOW!!!!!!!!!!!! What a great list of stories about these men (kids really), who fought and died during World War 11. Most of them came back and got on with their lives saying little to nothing about what they had seen and done….I salute them all for they are gradually fading away… here’s to keeping their memories alive…God bless them all..
My father served in 101st, 502 regiment, A company. His records were burned in the fire at the records center in 1973, so I have very little info on his actions. I know he arrived late, in Jan 1945. I do have his discharge which notes that he received service medal, victory medal, service medal with 2 bronze stars. My uncle, Major Milton Evans Dowse, was in the 508th Parachute Infantry and a communications officer. My cousin, David Paul Dowse, interviewed him in his later years. David wrote a spiral bound book that contained the interview. My Uncle Milton parachuted on D-Day. He was scheduled to drop at St. Mere Eglise, but ended up being off course. He talks about trying to find his was back to St. Mere Eglise but after a few days of wandering was captured. He said that for the few days he was trying to find his way back, and before he was captured, he helped some others tear down telephone lines, plus damage as many other things as he could. My Uncle Milton was a POW at Oflag 64 Prisoner Camp. This book that my cousin, David, put together is very informative. He included a lot of background information about D-Day and about the prison camp my uncle was in. My father was in the 82 nd. Was wounded on Anzio beach and survived despite being shot 3 times before he landed and shot 2 more times in the head to be sure he was dead. His name was Herbert Daniel Carter and he was in the Devil’s Brigade, he was paralysed and shipped back to White Sulphur Springs for rehab, at the now Greenbrier Hotel which at the time was Ashford General Hospital. He was employed for years at a paper mill in Covington, Va. His unit was awarded the congressional Medal of Honor in 2015. He did not live to see that day he died in 2010 from complications from his wounds. My father, Robert W. Hurley, Jr., was in the Headquarters Battery of the 675th GFA of the 11th Airborne. I know from his discharge papers that he left the USA on 31 Aug. 1945 and returned 23 September 1946. I know that he was in the Philippines and in Japan. He never talked about his time overseas, and I would like to know anything about the 675th. Shortly before his death we went to my sister’s son’s Jump School graduation. That grandson is currently a Captain in the Special Forces. Oh My Goodness, my father Howard E Bowers was also in the 11th Airborne of the 675th!!!!! He was a staff Sargent. I bet they knew one another! Thanks for the reply. Do you know which battery and time frame for your father? I found a picture album of Dad’s that had a few pictures of his time overseas. The other troopers in the pictures were not identified as I recall.